Scroll down to view the LynxAE products. 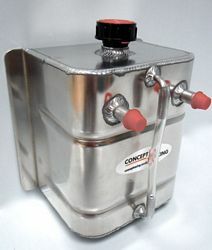 PH0008 - Universal Oil Catch Tank. 13mm inlets, drain, breather cap and sight gauge. 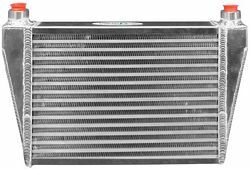 PH0010 - Water Cooled Oil cooler. 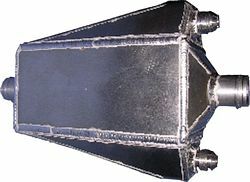 PH0011 - Universal Rectangular Oil Catch tank. 2 or 3 litre,13mm inlets, drain, breather cap and sight gauge. 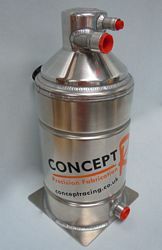 PH0014 - Flush fitting 3/4 litre oil breather tank. 2 X 1/2 inlets with breather cap and drain plug. Also available with 3 x 5/8" fittings, designed to fit K&N or Piper Cross. Contact for details. Available in 1 gallon or 1.5 gallon. The Ultimate tank for de-aeration and oil Scavenge. 150mm / 180mm. 5/8" BSP fittings as standard (JIC fittings available on request). Also available as twin scavenge or with different fittings, contact for details. The Vortex Dry sump tanks is specially designed to swirl the oil returning to the oil tank from the engine, combined with baffles inside the tank this helps to de-aerate the oil before it returns to the engine. 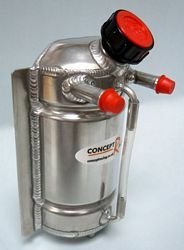 This high quality alloy tank features 5/8 BSP female ports with a 19 mm push on breather pipe as standard. 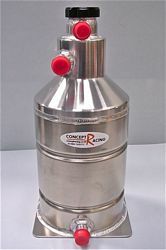 PH0016 - 1 gallon Cone Shaped Dry Sump Tank. Designed to improve oil pick up and eradicate oil surge. JIC fittings available on request price may vary. 470mm tall x 165mm dia. 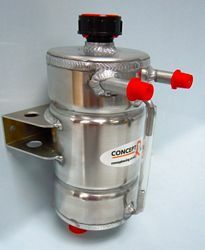 PH0019 - Standard Dry Sump Tank. Available in 1, 1.5 & 2 gallon capacities. 5/8 BSP fittings as standard (JIC fittings available on request). 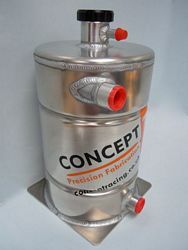 Concept Racing Dry Sump Tanks are a high quality aluminium construction with an internal baffle system to help prevent oil surge, starvation and aid de-aeration. As standard the tanks are fitted with 5/8 BSP female inlet and outlet ports and a screw on filler cap with a 13mm breather outlet on the filler neck. The Ultimate tank for de-aeration and oil Scavenge. Also available as twin scavenge, contact for details. Prices and product specification may vary without notice.